Strange things seem to be going on in the garden. 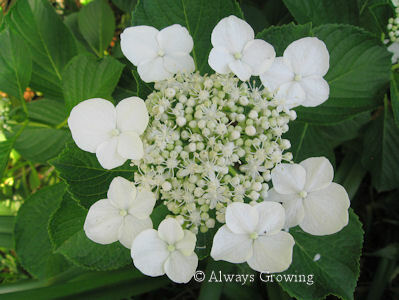 I’ve been growing hydrangeas for many years, but I have never seen this before. My white lace caps bloomed as lovely and normal as ever earlier in the spring. About two weeks ago, I went around and cut off the spent blooms. 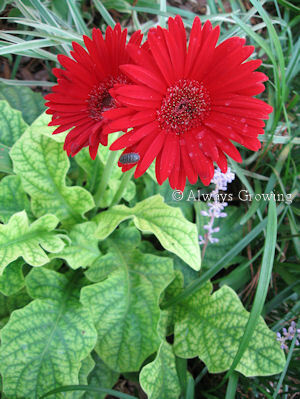 There already were buds for new growth showing up farther down the stems. About three days ago, I noticed that new flower buds had sprung up on one of the new growth areas. Yesterday, I was startled to see the flowers starting to open, but they were not the normal lacecap ones. Here is what the flowers looked like this May. I am sure this has something to do with this being a second flush of flowers, but I don’t know why. I guess this goes under the “you learn something new every day” category. 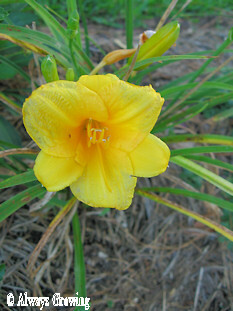 A few years back, I was startled to see a small plant starting to grow on the flower stem of a daylily (that post is here). 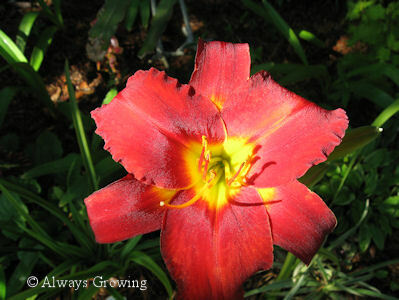 I soon found out about poliferation, a leafy shoot on a scape of a daylily plant. It often times will form roots which will allow the shoot to be planted to form a new plant. 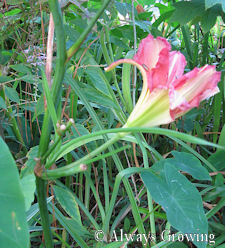 When it happened to one of my daylilies, the proliferation did not survive. Usually, I cut back the stems of spent flowers, but somehow, a stem of Misty Mayhaw got by me. Imagine my surprise when I saw buds coming from the middle of the stem. I never thought that a proliferation would have flowers. But, sure enough, there were two buds. The first one did not open properly, but the second on did. Now, I have to see if I can get this proliferation to live on its own. 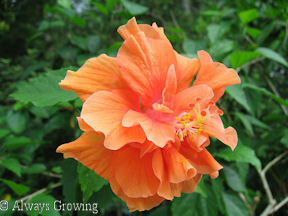 I thought I had seen just about everything, but seeing that flower shows that we always have something new to learn. Looks like there might be a problem with capping the oil well in the Gulf. It has been reported that there is some seepage of oil near the well head. Everyone around here is hoping that the cap won’t have to be opened to relieve pressure thereby sending more oil into the Gulf of Mexico. After Hurricane Katrina, there were garden flags sold that encouraged people to return to the New Orleans area and restore Louisiana. The fleur dis lis on these flags became the symbol for hurricane recovery. The oil spill has spurred the same commitment, and flags have started showing up. I am sure you have seen the photos of the oily pelicans; the pelican has now become the symbol of Gulf Restoration. 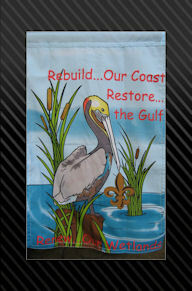 I bought my flag last week which touts Gulf Restoration. A portion of the proceeds of the purchase price will go to the Audubon Institute’s Bird Rehabilitation Project. Please pray that this well cap holds until the relief well is finished, and the well is finally capped. Then, we can begin to clean up this mess and begin to heal people’s lives. NBC Nightly News did a heartbreaking story on the many Gulf Coast pets that have had to be surrendered to animal shelters because their owners can no longer afford to care for them. You can see it here. It shows that it is not only the wildlife like pelicans, turtles, and dolphins that have been hurt by this disaster. I found this prayer for the Gulf on the internet and wanted to share it with you. the terrible suffering of all life-forms in the Gulf of Mexico. and the threat to coastal ways of life. Have mercy o God, have mercy. to all who struggle to contain this disaster. Let those who lost their lives rest in peace. to create anew the face of this earth. The coastline of the Gulf of Mexico is not Louisiana’s coast, or Texas’s coast, or Mississippi’s, or Alabama’s. It is America’s coast, and belongs to everyone. Everyone needs to demand that this area be restored. I love white flowers. I love roses. I love white roses. Gardening in the hot, humid south means that some plants struggle here. Roses are one of those plants. 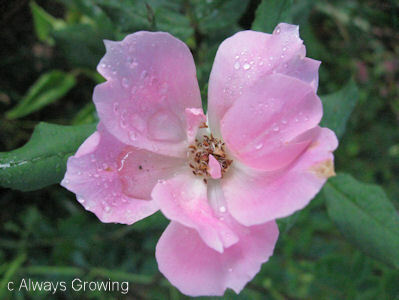 Because of our high humidity, if you want to grow roses without having to spray, that means no hybrid teas. The few roses that I grow are floribundias, Ghinas, or Knockouts. The white rose I have is Iceberg. 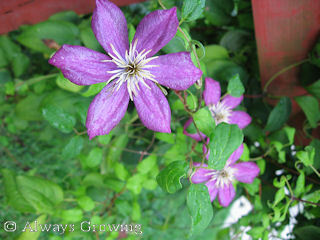 While it does bloom very well in the spring, the three I have just seem to struggle. I think they just aren’t real happy here. That is why I was looking forward to the development of a white Knockout rose. I have had great success with the Knockouts. While I have one of the red and one pink Knockouts, it is Blushing that is my favorite. There are now four of that one in the garden, but it is a white one that I really wanted. 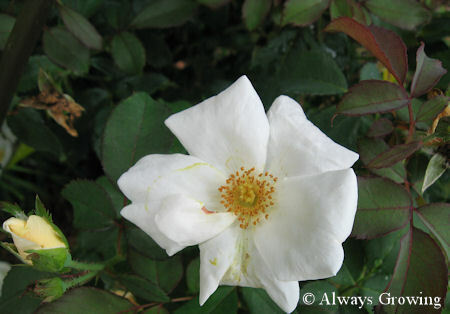 Last year I read about White Out (Rosa Radwhite) from the developer of the Knockout roses. While this is not a Knockout rose, it is the closest they have come to a white Knockout. 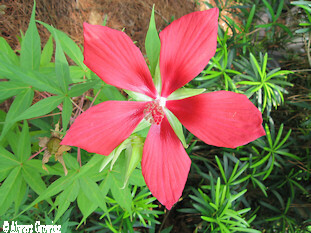 It is supposed to bloom as profusely as a Knockout, but reportedly, it is not quite as disease resistant. I found White Out when my sister and I went shopping last Friday. (The above photo was taken before new buds opened, so the flower is a little damaged from being in the car.) I was so excited to find this rose. I had been looking online since I had not seen it locally, but the shipping costs can be very high for container roses. This rose is supposed to be resistant to diseases and a prolific bloomer like the Knockouts. The flowers have been described as cream white, but I think they are really white. I am hopeful that this new rose will perform well in my garden. If it does, I will be planting more. I can’t have enough white flowers. This certainly is turning out to be a daylily summer. 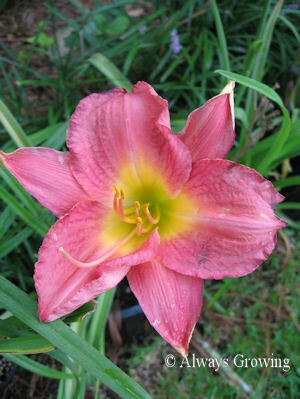 I have added three more daylilies to the garden. Last Friday, my sister and I went out shopping, and, of course, we had to stop at a few nurseries. 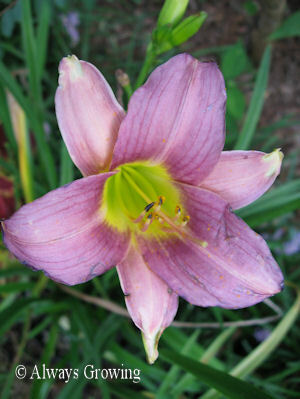 The heat was almost unbearable, but worth it as I found daylilies in bloom and on sale. My plan to add more blooming perennials to the garden is coming along very well as I am finding so many lovely daylilies. Please excuse the condition of the flowers. Each plant still has several buds, but I wanted to share the pictures with you as soon as possible, so I took these photos of the flowers at the end of the day after they had been in the car. There is a little wear on the blooms, but you can still see how lovely they are. 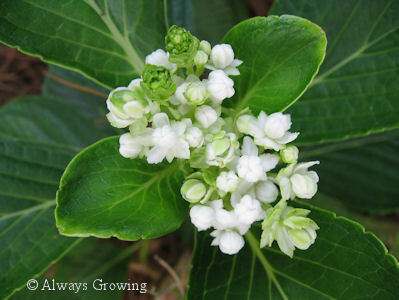 Here is Little Wart, such a terrible name for such a lovely flower. Next is Clara. I bought two of this variety. Finally, there is Joylene Nichole. All of these daylilies will go in the “pink” garden. 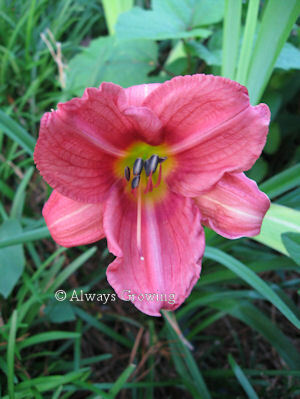 I think that I have enough pink daylilies, and I am now ready to move onto other colors. 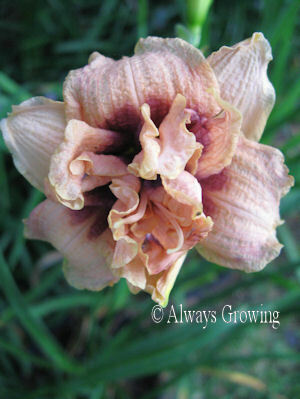 Some of the darker colors are attractive as well as the spider type daylilies. 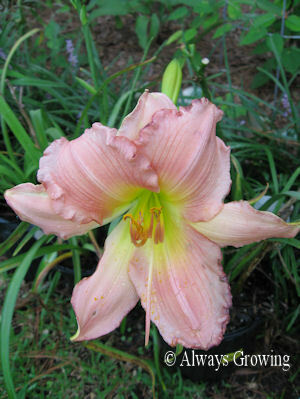 I am really excited about daylilies now. After adding over ten daylilies to the garden in the last month, this summer is really turning out to be all about daylilies. 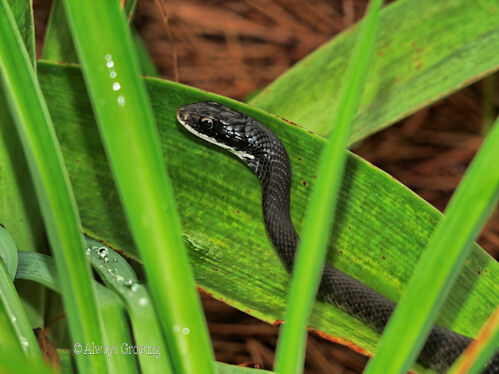 Ever since we have moved here many years ago, from time to time, I have seen black snakes in the lawn or garden. Sometimes they are fairly large, but mostly they are small, young snakes. The first few times I saw these, I freaked, but now, while I am usually startled, I don’t run the opposite way. This year, however, there is a small, black snake that has taken a liking to my garden. I have seen him several times, in many different areas of the garden. It usually doesn’t stay around but slithers off to more secluded areas. Yesterday, when I saw it sunning itself on an amaryllis leaf, probably trying to dry off, I called dear hubby to see it, and he took a quick photo. Whenever I see a snake in the garden, I am always reminded of one of my favorite Emily Dickinson poems. I know that tighter breathing. Grasshoppers are still attacking the garden, but there were casualties on their side since I lasted posted. I must now report on a second front that has opened in the Garden War of 2010. It is not animal foe, but plant one. 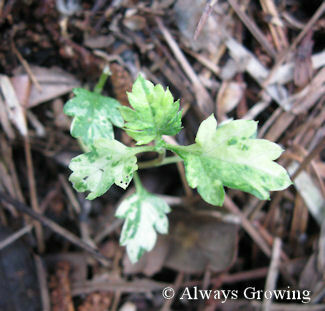 I am fighting and determined to eliminate Artemisia Limelight. Don’t ever plant this stuff in the garden. I planted this about six years ago, and it was fine for about two years, and then – trouble. I love variegated plants and this seemed perfect for the partial shade of our entry garden. At first, this seemed like a great plant for that area. Its variegated foliage brought some light and color especially in the shadier parts of the area. In winter, when so much of the garden is dormant, this was a nice addition. The cold did knock it back a bit, but in spring it came back just fine. I even transplanted some of the spreading plants. After the second year though, it became a thug. It seemed for every one plant I pulled up, three more grew in its place. Part of the problem is that when yanking this plant out, the stems break leaving the roots. Another mistake I made was that I would pull up most plants but would always leave a few because this was such an attractive plant. Leaving a few plants was the problem. It always seemed to spread too much. The last two years, I have been pulling up the little babies, but still they kept coming. This spring I decided I would give no quarter to this plant that was invading my garden and making it look so unkempt. I have been digging up and pulling Limelight for four months, and finally, I may have it beaten. I say “may” because we have just had several days of heaving rain and that may help it come back. 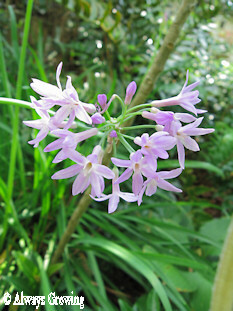 This afternoon when I checked, I could only find about five plants which were quickly dispatched. It seems this is a battle I may be winning. This is such an attractive plant, and it is a shame it is so aggressive. In researching this plant, I have found I am not the only one having a problem with this particular artemisia. Learn from my mistake, don’t plant this artemisia in the garden. It may do well in a container, but beware. I have read that even then it tries to escape.